For years I was a scrawny 175lbs and loved it. Then I was married and became a consultant. My weight went up and my activity level dropped at the same time and I soared up above 300 for a while. Now I am on my way back down and I am working out again. When I was in high school I ran track and cross country. My senior year I did not have the money for a pair of CC spikes so I grabbed my track spikes and used those. The track spikes were designed for sprinters so there was no padding at all, and only a gum sole for traction beyond the plate with the spike in it that sat at the ball of my foot. Interestingly enough, I actually ran best in those shoes that in any other shoes I had. Recent research has answered the question of why this is so... We were not designed to have our heel sitting so high above our toes, and running in conventional shoes causes us to run incorrectly and can ultimately lead to injury. I damaged my knees years ago running in a 10K race, and have not been able to run any real distance without some pain in my knees since then, until I wore a pair of VFFs. To facilitate that workout I have been doing research on new shoes since the pair I have are worn and not helping my much. 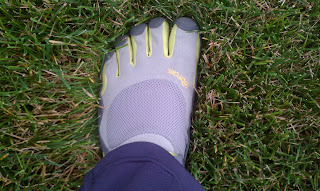 My research led me to the science of barefoot exercise and eventually to BirthdayShoes.Com. Great site all about minimalist shoes and the options we have in those types of shoes. This led to my purchase of a pair Vibram FiveFingers. 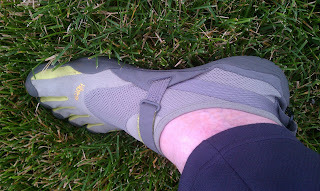 I have to say, if you like being barefoot, or want to improve your physical condition these shoes are worth looking into. They come in several different models, each serving a different function. The two main models that people see are the Classic and the KSO. The Classic is something akin to a slipper, and the KSO has a higher upper to Keep Stuff Out. I purchased the KSO since it was a pretty much all-purpose shoe and I wanted something to weightlifting, running and walking. I chose the green and camel colored shoes as I get felt that the black pairs might have been a bit too obstrusive. As you can see from the pictures they do look a little strange, but once you have them on your feet, you quickly find that they are probably the most comfortable shoes you have ever worn. 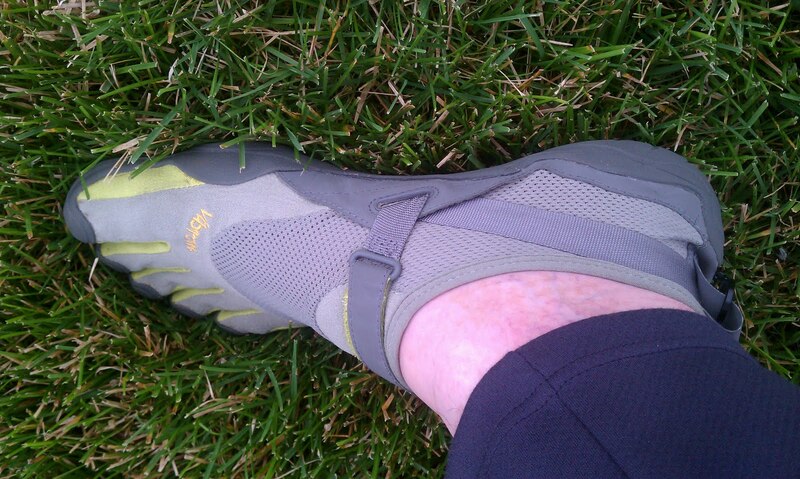 Probably the most noticeable feature is that there is a pocket for each of your toes. This can be a bit cumbersome to put on when you first get the shoes, but as you learn to wear them you will also quickly learn how to put them on with out a struggle. The soles of the classics and KSO look as though it is a smooth surface, but if you were to bend the shoe you would quickly notice that the sole opens up and there are lines cut into the surface. 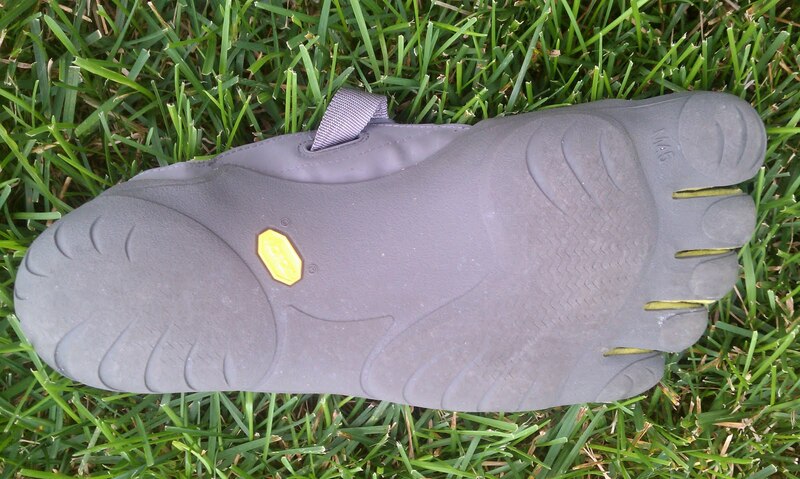 these are there to give you more traction when you are flexing the shoe. One word of warning though. Unless you spend a lot of time being active and barefoot, you will need to breakin your feet to wear these shoes on a consistent basis since your feet have been forced to work in a fashion for which they were not originally designed. prefer to be barefoot or at least wearing socks, but I find that I have to take a break from them once in a while because I have to learn how to walk correctly again.